This was a food tour that was about more than just the food. Renée knew her stuff. And we were taken on a tour of not only the food, but of the people who prepare and serve it and the neighbourhood that they call home. It is a cultural walking tour that focuses on real lives with the added benefit that these people’s lives are about their passion for food. We visited 10 places in all. And what better way to start than with breakfast of a glass of cava (Spanish champagne) and a grilled botifarra (Spanish sausage) inside pa amb tomaquet (bread liberally rubbed with fresh tomato) served to you by Rosa who took over Can Tosca from her father. I’m not sure too many of the local Catalans started their day with cava but I certainly wasn’t going to complain. Next up was Granel, what I call a seed shop. But in actual fact has a plethora of products that can be purchased by weight. Seeds are probably in the minority. 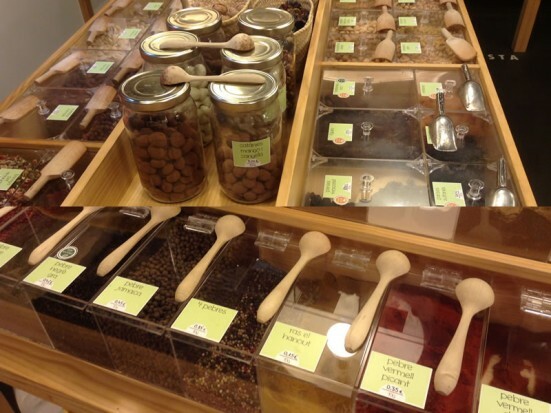 There are herbs, spices, pulses, flours and rice. Chocolates, nuts and oils – and those cookbook ingredients that are hard to found anyway else. It’s pricey. But if they have what you need and you can’t find it anywhere else then that’s the price you pay. Literally. We tried some delicious chocolate truffles with mango powder and some locally harvested nuts. 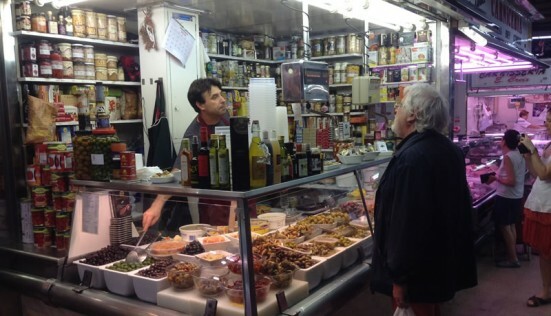 At Gràcia market (officially Mercat de l’Abaceria Central) we visited two delightful counters. 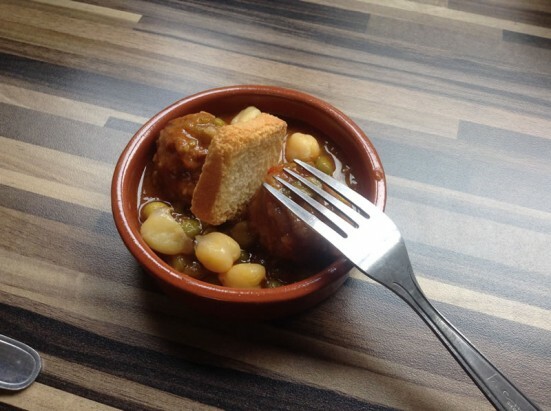 One serving all manor of olives and other canned goods (a speciality in Catalonia). And the other served cheese and cured meats. We tried a delicious salt cod and olive skewer at the first. And a couple of cheeses and cured pork products at the second. One of the cheeses was called Idiazabal. This multi-award winning cheese is actually from the Basque country and even has its own website! It was very, very good. 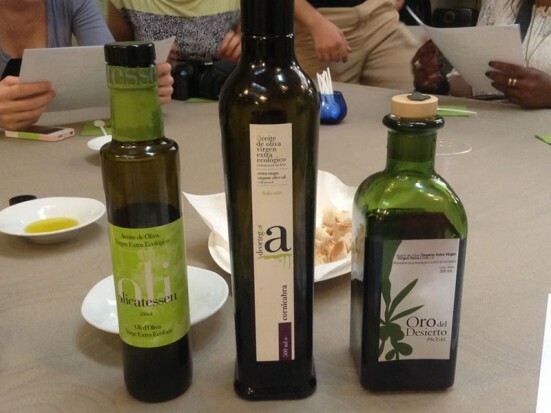 At Oli Sal, a shop full of organic extra virgin olive oils, (as well as the largest book I have ever seen devoted to salt), we were taken to the back and given 3 different types of extra virgin olive oil to try. They were all delicious but my favourite was a slightly peppery one made with the Cornicabra olive. It was amazing. You could try them with bread or by the spoonful if you preferred. Of course I preferred both. L’Anxoveta is a lovely place in Gràcia for traditional tapas. And la Bomba is as traditional as they come. Potato “bombs” filled with ground beef, deep-fried and served with a spicy brava sauce. 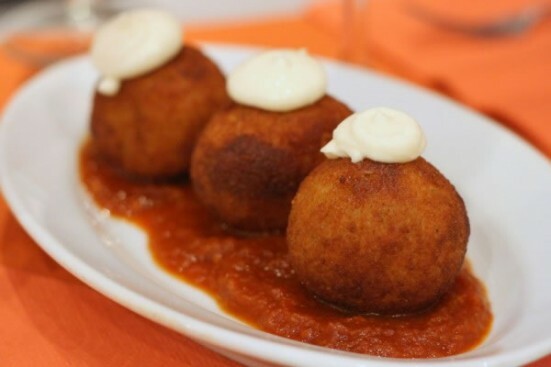 A good bomba is the spiciest thing you will be able to get in Barcelona. They really don’t do hot spices here. And L’Anxoveta definitely serves a good bomba! The history of la bomba goes back to the civil war and is named after the weapon of choice of the anarchists. It is said that a Barceloneta bar owner, Maria Pla, created this playful dish back during that turbulent time and now you can find it all over Barcelona. If you see it, try it! 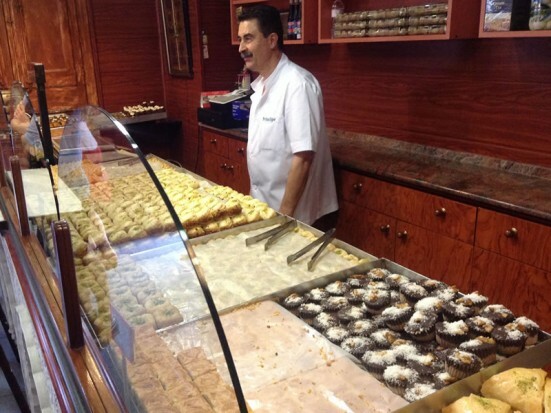 Now, traditional Syrian pastries should not be part of a Barcelona food tour should they? Well you might think that until you were taken to Patisseria Principe. The Syrian owner of this little pastry shop came to Barcelona on holiday over 30 years ago and never left. You’ll find his pastries in many of the establishments around Gràcia. He and his team start early to hand-make thousands of little pastries every day. We got to pick the one we wanted. They all looked delicious. But I have a pistachio craving that constantly needs feeding so went for a pistachio and rose-water pastry that was so light and sweet and yummy I have since been back for a box of them. It was a small box. Promise. Give me a traditional, local bar in any country and I am a happy man. And Bodega C’al Pep is definitely such a bar. It’s like being in someone’s house. In fact it is converted from the original living space and the previous owner used to sleep on a mezzanine floor right above the row of wooden barrels. L’hora del vermut is another Catalan tradition that I happily partake in. 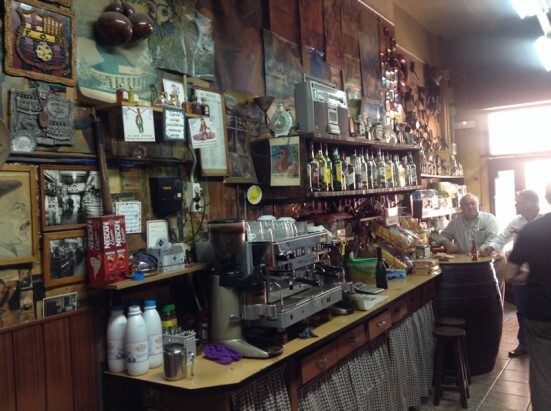 I have written about my favourite vermuteria before and this place is another such delight. Vermut is a fortified wine flavoured with a variety of dry ingredients. Traditionally served with a green olive we were also given crisps doused in the famous Espinaler sauce, a sauce made with vinegar and paprika. Watch this short video about the Espinaler experience and the tradition of el apertivo. Traditional. Homemade. Catalan cooking. This place is small. But it is as traditional as they come. Homemade meatballs in a bean and pea gravy. Fideua (a paella made with short spaghetti instead of rice). Cazuelitas (mini casseroles). Escalivada (a traditional Catalan dish of smoky grilled vegetables). If you’re in Gràcia pop in and get some homemade cooking to take away (para llevar) and sit in one of the beautiful squares nearby. After a short stop at Gaudí’s lesser known work, Casa Vicens, the final stop was Pastisseria Ideal for one of their ultra Catalan mini cremats. 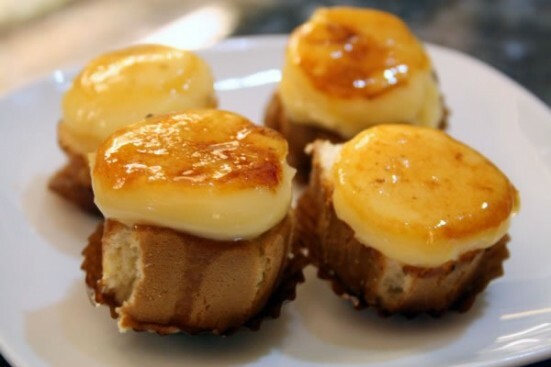 A mini pastry with a kind of crème brûlée type cream topping. This was another stop that had been around for generations, passed down through the family that adorned the walls in old photos, proudly standing outside the shop. This place is a Gràcia institution and it was a perfect way to end the food tour. This was a lovely tour and the neighbourhood of Gràcia is a great choice for what is the first of Devour Barcelona’s food tours. I’m sure there will be changes along the way and many other tours to come from them. If you are a Barcelona local or have lived here for any length of time then this particular tour isn’t for you (they may have others in the future that are). You will probably have already tried the things you’ll be tasting and may have even visited some of the establishments or at the very least, the neighbourhood of Gràcia itself. But, if you’ve just moved to Barcelona or are visiting I would happily recommend this tour. It gives you a taste of the food Catalonia has to offer, your guide will share some wonderful stories of the people who run the local establishments you will visit, and you’ll get a healthy dose of cultural history along the way. It is four hours well spent in the wonderful neighbourhood of Gràcia. Don’t believe me? Then have a read of these other reviews from people who joined me on the tour. And I’m sure the food tour will be rated highly on TripAdvisor soon enough! 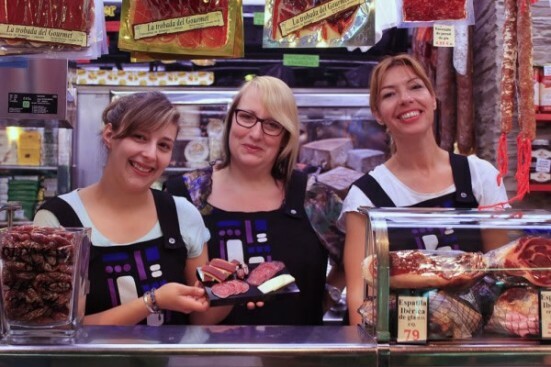 Or if you’re ever in Madrid check out their sister company, Madrid Food Tour. Thanks Rob! We loved having you along! Your bomba picture made me salivate all over again. I loved this tour, and I think one of these days I’m going to make the trek up to Gracia and order a full meal at L’Anxoveta. I’m sure there are bombas closer to home, but I loved that place! P.S. Thanks for the post shout-out! Hey Jenny, I actually pinched that photo from the Devour website. Mine weren’t as good. See you at L’Anxoveta!